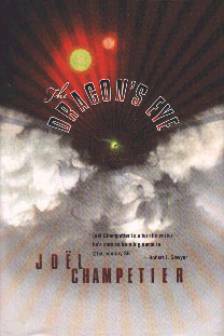 Joël Champetier's The Dragon's Eye (seamlessly translated by fellow novelist Jean-Louis Trudel ) is a crossover novel: the setting is hard sf, but the plot is pure spy thriller. The point of setting a spy thriller in an sf locale is that the reader is too removed in time and space to have ready-made, knee-jerk reactions to the political issues of the day. The point of plotting an sf novel as a spy thriller is that the reader is so caught up in the page-turning action that Champetier is able to sneak in all sorts of literary values that elevate this novel well above the norm for hard sf. The action takes place on a planet of a binary star system, where the second sun pumps out such high levels of UV that all outdoor activity essentially comes to a standstill while its up. Since this significantly diminishes the desirability of this piece of stellar real estate, the world has been left to the Chinese to settle -- the Europeans and Japanese having grabbed off all the good planets. Setting the novel in New China was a refreshing change from the usual projections of Anglo-American culture that dominate our genre, and the sociological half of Champetier's world building is easily as significant and intriguing and believable as the physical setting. For example, without ever digressing from the heart-stopping action, Champetier has nevertheless managed to provide an excellent illustration -- one could almost say analysis -- of colonialism at the end of empire. When hard sf is successfully combined with social science fiction the interplay often gives rise, as here, to some of the very best our genre has to offer. If the centrality of the setting is characteristic of Canadian sf, than so are the characterization and themes. Champetier's cast of double agents and hapless bystanders is pure Canadiana. Our protagonist may appear to be a typical Ian Fleming superspy, but he keeps fumbling the ball in typical Canadian fashion. Indeed, it is not even clear that he is fighting for the right side, because -- as with THE BOOK OF KNIGHTS -- Champetier's characters are adrift in a sea of moral ambiguity. In this spy novel, even the ends don't come close to justifying the means . Similarly, Champetier characterizes the New Chinese as motivated by the desire to recreate the best of Imperial China, before the intrusion of Western and Japanese influence. This may strike some American reviewers as anachronistic or unconvincing, but anyone familiar with the history of New France knows that the colony was founded in part out of the desire to recreate in the new world a pure Christian France, unsullied by worldly and foreign influences. Thus, Champetier has merely projected a tiny aspect of Canadian history into a completely believable future, even though the setting is Chinese. But let me reemphasize: this is a tightly written (and skillfully translated) novel that cannot be put down once it is picked up. If you ever needed proof that "Canadian" is not synonymous with "boring", this is a good place to start.